New server browser, sleeping bag timers, structure aging and more! 1:38pm EST - We are at the halfway point in Rust development for the week and the team is rocking out commits like crazy. We’ve got some exciting new concepts and an exclusive sneak peak at the new server browser. Note: None of these changes are live on the main branch yet, however, my guess is we’ll see some of them in game by Friday. Garry shared the above screen of the new server browser with me earlier today. Along with the overall design being much better, this new browser includes some sorely needed missing functionality. Server favorites and history work, along with more statistics in general. Another thing I’d like to point out, because all this is being done in the Unity UI system (instead of Coherent UI), it should be a lot more responsive. A couple days ago, Maurino put the new sleeping bag model in. Today, Garry has added some new functionality to sleeping bags. Mainly, sleeping bag timers are back in. If you remember from legacy, you could only spawn in a sleeping bag once every 4 minutes. Sleeping bag names have also been added. This will allow players to name each one of their bags. Along with names and timers, different buttons for each sleeping bag been added. I believe this means you’ll be able to select which bag you spawn in as opposed to it being random. Good stuff! Maurino is doing a bunch of work on the lootspawnchanges branch. Along with tweaking the loot spawns in rad areas, he’s added a new loot container. This means our days of hitting only barrels for loot are numbered. I chatted with him briefly and there are some exciting changes to loot coming soon (more on that in the next day or two). Zon is continuing work on the animal AI. Most notably, he pushed a fix for these NPCLocomotion errors which have been spamming server consoles and negatively impacting performance. Server owners, in the mean time, if you’re seeing these errors, run ai.move 0 on your server and they should stop (along with all animal movements). Minh just posted two videos of the new animations for players bandaging themselves: First person, Third person. Tom added this video of the sawn off shotgun in game. Awesome, looks like we’ll be seeing this gun in game in the near future! 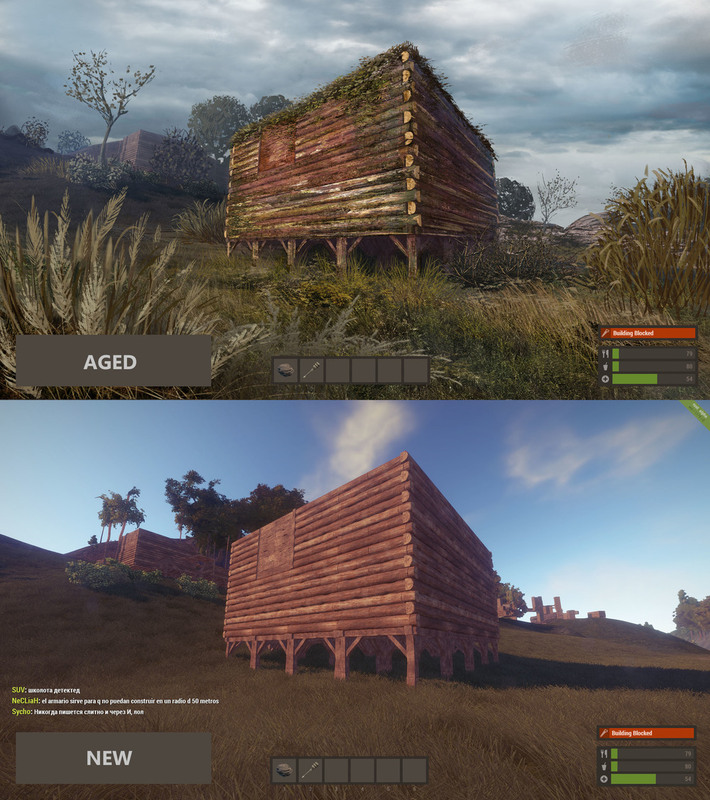 Howie added a new trello card for structure aging along with these two images. 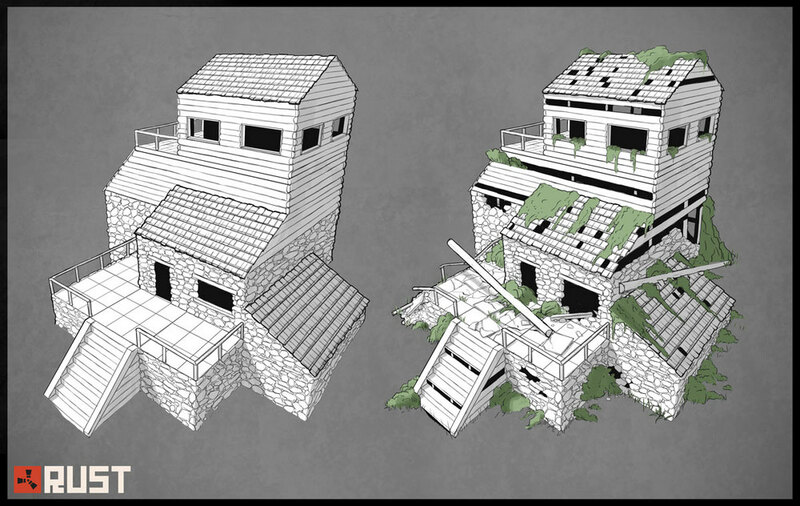 I love the concept of being able to tell the age of a structure by looking at it, can’t wait to see this in game! Comments? Questions? Feel free to chat on Rustaforum.